2018 is at the exit-month: December and time to give all the year-long content a new lease of life so your marketing strategy can cap it all in these four weeks. 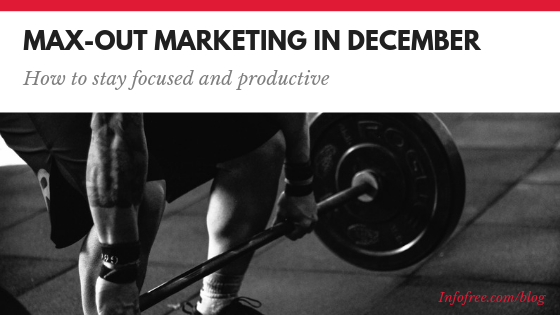 Your best marketing ideas need an injection of fresh impetus so those can cap it all with flying colors in December. A closer look will show where your experts can improve the presentations on different platforms without changing the basics. Most of the new strategy changes that work best – usually will be on social media platforms. A discerning eye will show which social media approach needs a change of clothes. For example how you can make your Facebook page more attractive or engage in conversations on Twitter or post business related pictures on Pinterest. December is the month of festivities and color is in the air. Depending on your business sector – go ahead and add color to your presentations. This is the last opportunity of 2018 so indulge but with caution. Music appropriate for your business can bring attention to your products and solutions. Appealing music plays an excellent catalyst role to bring prospects. Sometimes a tune stays in the head and keeps prospects bringing back to you. In both the above approaches of color and music, the appropriate quality and quantity need optimization with an expert overlooking the implementation otherwise the results can be disastrous. As retailers go for appropriate colors and musical tunes to attract attention, your online team can generate short, concise and soothing colors and tunes to highlight your offers on your websites and other online presence. Nothing will bring a more genuine feeling of appreciation in your customers, prospects and business associates than a short, concise and personalized in some way – a note Thanking them for being associated with your entrepreneurial spirit. If you are a retails business outlet or have a physical office, then do not forget to thank the cleaners, delivery people and mailmen/mailwomen, just to name a few. Your business will be helped by those invisible hands more than you can perceive in real time. This entry was posted in infofree SMB Blog and tagged Database Marketing, direct mail, email marketing, entrepreneur, Find New Customers, grow my sales, increase my sales, infofree.com, lead generation, mailing lists, Sales Productivity. Bookmark the permalink.